Oh, something smells soooo good! Tagged blogpaws, cat, cat photos, funny cat photos. Bookmark the permalink. Christy, you’ve got so many great gifts to discover! I bet there are some yummy treats in there! Wow, Christy! That’s a swagalicious bunch of the good stuff! Isn’t it!?! Can’t wait to get it all home. That is better than Christmas. Way more stuff than I got at Christmas. I got more after this! 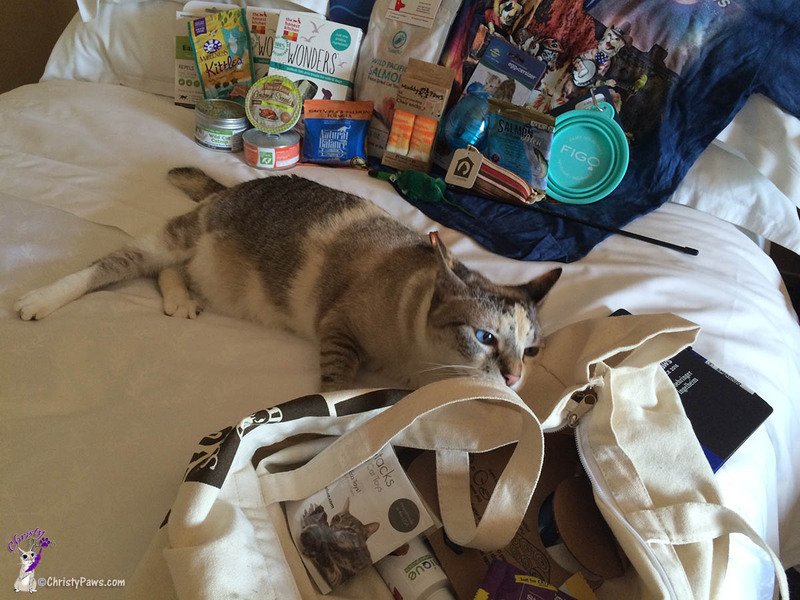 One of the best part of going to BlogPaws yourself – getting to see all the swag before the other kitties! Looks like you’ve found the perfect place to hang out! Oh Meow Christy dat looks pawsum. Enjoy. It’s so much fun, Dezi. I sure wish you could have been there. That sure is a nice bag of fun! There is so much awesome stuff and I got more later! WOW! Blogpaws Swag Bag – the gift that keeps on giving!!! And it did. I got even more later. Glad to see you put BlogPaws in the title so they will see it! Great swag and I love what you gave to the humans! Wow – that’s a ton of stuff! Perhaps, a little catnip? So sweet! We LOVED our swag bag!